Exploding Doughnut: That yellow chair. It sat there quietly all these years. Broken, worn, and marred. A bit like me. Perhaps that's why I've kept it for so long. 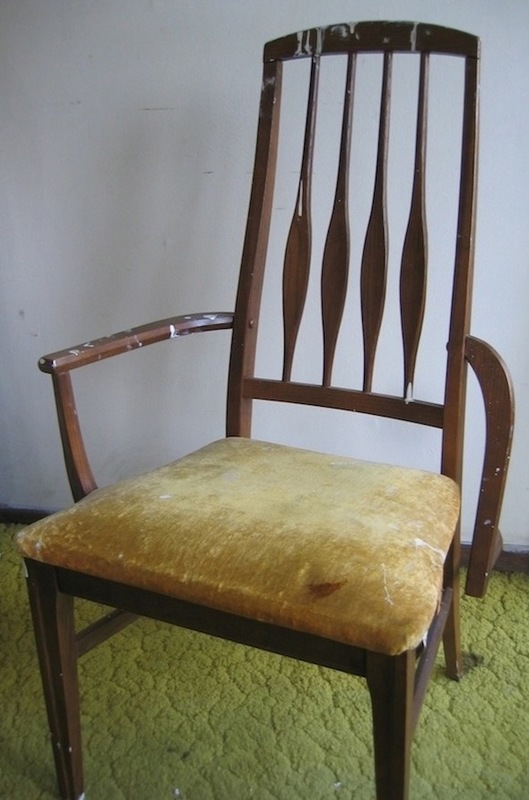 We have this vintage yellow chair stored away at home. I think my father brought it from some job-site of his decades ago. The chair's underside crumbles into a powder where the seat and frame join together. The wooden back is covered with paint-drips and the left armrest has fallen off (you have to push it back into the nail holes). But for all its problems, it still functions and serves its purpose. An old soul that's seen better days. Most would view it as damaged, laugh at its condition, and not want anything to do with it. God, I know what that feels like. I have visited this chair many times. Sometimes to sit on it and ponder things, sometimes to play with the armrest and see how soon it'll dislocate from the rest of the chair, and sometimes just to stare at its charm. For it has character to it and a story to tell! I won't be able to take the chair with me when I move next month but hopefully my family holds onto it for me. There's something very special about that yellow chair. It's sort of the Velveteen Rabbit of chairs. I don't know a lot about modern furniture but it's quite desirable. I'm amazed at the prices it can fetch. You could have something valuable in that chair. I'd try to research it, maybe there's a tag on the bottom of the pad? Resist doing anything to it until you know its value. I say that because I'd be the first to strip off those white paint drops and sand it, stain it and apply some type of protective finish and get it re-upholstered. Thus, destroying any value it inherently had. But, that's what I do. Well, you could sell it to me, but you know what I'll do to it. Ooooh, Velveteen Rabbit. I like that comparison! I never thought the chair could be worth money but I'll definitely look up the name stamped on the underside of the seat.